Blind Guardian are a German band but they sing in English, and their music style is described by uk.mp3.com as “Power Metal.” The band has become very popular these last years, and they have produced nine albums so far. The bands members are Hansi Kursch (vocals), Andre Olbrich (guitar), Marcus Siepen, (guitar), and Thomen Stauch (drums). “Nightfall in Middle Earth,” is their eighth album, released in 1998, and is dedicated to JRR Tolkien. Blind Guardian’s songs are not the ordinary type of Lord of the Rings-based music that you find around. The melodies are not Tolkienesque at all, but the lyrics tell the stories of the races of old that are interesting to hear in a new way. Personally, Tanlaithwen is not a Power Metal fan :), but she knows a lot of people who are, and they would probably like Blind Guardian’s music. Their style is “in fashion” at the moment, especially with the younger generation, so Blind Guardian’s songs are a very good way of introducing Tolkien to those who prefer CD Players to books. My personal review of the album is that it’s a nice album. I liked listening to the lyrics, and I especially enjoyed the quieter melodies. This track doesn’t have any singing. It’s just the Ring Verse being recited to eerie sounding music. Very cute and hobbit-like. It has a nice peaceful sound, as if someone were really travelling or going on some new adventure. 3: Tom Bombadil’s Song, Hey dol! Merry dol! This is a very happy sounding track. It’s exactly how Tom Bombadil and Goldberry should sound. Has a fun and exciting tempo. Another sad and peaceful one. The instruments make it seem very dream-like and Elvish. Galadriel truly sounds weary and sorrowful. 7: Elven Hymn to Elbereth Gilthoniel, Snow-white! Snow-white! The wind chimes at the beginning are nice; as if one was entering into a different world. The sound gives it the feeling as if the Elves really are sad and weary. This song is very Ent-like, being one of the longest tracks on the album. It moves slowly and I feel as if I’m going to lose my patience. I like the harmonica in this one. Yet another nice, happy Hobbit song. Unlike the other hobbit tracks, this one sounds more like a lament. Poor Sam, his sadness is expressed and felt so well. The same as track two, only a reprise. This album features the Commotio Quartet, a male choir, and professional Danish musicians. It is dedicated to Christopher Tolkien. Along with other Tolkien Ensemble albums, this album is perfect for those who skip over the poetry in the books. I loved this album. The hobbit songs sound hobbit-like and the elf songs sound elf-like. This track has a slow tempo and sounds rather sad. This track sounds proud and serene. Galadriel’s voice can be heard at times, as if you are being brought to Lórien through Gandalf’s song. The verse is repeated twice with the first being the slower of the two. Aragorn’s voice sounds calm and far away, as if he was in a dream-like state. This track sounds sad, yet peaceful and happy, almost like a memory. Frodo sounds, as he should, as if he is remembering happy times, yet there’s still a hint of sadness in his voice. This one sounds as if Bilbo’s peaceful thoughts and memories are being told as a story. Gollum’s voice is very interesting in this track. It’s shaky and cold and angry. There’s also a sneaky sound to the whole song. This track doesn’t start out like a lament, too me. It gets more calm once it gets going. Throughout the lament, the tempo varies. I think it would be better with a solid, slow tempo. Finally! A happy Hobbit track. It doesn’t have a quick tempo, but it does have a nice traveling pace. I like the instruments used in this track. It sounds sad, yet lovely. This is my favorite track on the album. This track really does sound like a lament. The voices of the people of Rohan start out quiet and gradually get stronger. They do that throughout the whole track and do a beautiful job of getting the idea across that they are truly lamenting their king. This is another one of my favorite tracks because it’s so beautifully done. This track is also done with a choir. It’s sad, yet powerful, a lot like the previous track. The two go together very well. The choir gives the impression that a story of something sad and horrible is being told. The voice of Rivendell in this track sounds far away and sad. It’s really beautiful and sounds like a song one would really hear sitting in the Hall of Fire in Rivendell. This album features the Chamber Choir Hymnia and professional Danish musicians. It is dedicated to Priscilla Tolkien. Overall, this is a very nice album. It’s a bit more calm and sorrowful than the first, but it is still very beautiful. In the booklets, all the poems are printed with short passages from the book, but chapters aren‘t given. Illustrations were done by Her Majesty Queen Margrethe II of Denmark. They really are lovely, but they’re not in color. I highly recommend these albums. The music has even been complimented by the Tolkien Estate. It’s very obvious that this ensemble put a lot of work into the music they create. However, this album may be a bit difficult to find. This track is also on the first album, except this time it’s with Christopher Lee! This is such a fun Hobbit song! It would be such a good song to travel to and sing along with. This track makes the Paths of the Dead seem really horrible and creepy. And now for something completely different… We go now from the Paths of the Dead to a Hobbit drinking song! This track has some really interesting sounds and instruments. Christopher Lee has a very good Ent voice. Overall, this track is very fitting for Treebeard’s character. Like I said, Christopher Lee is wonderful. This track seems very powerful. Éomer sounds very pensive and reflective. And now for something completely different, again… I really like this one. It’s my favorite song in the books and this ensemble makes it sound like so much fun! I can really picture Pippin making a mess. This track uses some very unique percussion instruments. Finally, Legolas! I really like this track because it has a nice peaceful Elvish sound. It really stretches out the rather short poem. This track isn’t even a minute, but it’s still nice. So peaceful and cheery. I really like this track too. It sounds Elvish and has a good tempo. I feel like I should be dancing along. The lute adds a nice touch. I really do love Christopher Lee as Treebeard. I didn’t know he could sing so well! This track sounds very Entish and it seems like you’re walking through an ancient forest. Another nice Hobbit song. Merry and Pippin sound anxious and excited. Almost like they’re anticipating what is to come. I’m reviewing the last two tracks as one because they go together. Track 19 starts out peaceful and sad with the Hobbit song. Next, the Elvish voices start coming through. The two tracks sort of blend together, which is really nice. I really like the Elvish hymn. It sounds so sad and captures perfectly the mood of the Elves. There’s quite a long pause, and you’ll think it’s over, but it really goes into “The Road”. It makes a nice conclusion. This part of the books is so sad, yet a bit happy. The ensemble did a wonderful job of capturing the moods and feeling of this part of the books. Tolkien’s words really seem to come to life. Wonderful! Amazing! Breathtaking! Enchanting! This album has a nice mix of fun songs and sad songs and eerie songs. This album features Christopher Lee, the Copenhagen Chamber Choir Camerata, the Copenhagen Young strings, and professional Danish musicians. Like the booklet for the previous two albums, this one is also illustrated by HM Queen Margrethe II of Denmark. It also has all the poems printed out. What it is missing, though, is a little set-up passage from the book. I really missed that. Symphony No. 1 was composed by Johan de Meij and the original symphonic band version was premiered on March 15th, 1988. In 2001, the orchestral version was premiered by the Rotterdam Philharmonic Orchestra. This version is performed by the London Symphony Orchestra (LSO) and is conducted by David Warble. This track is simply amazing. It’s the perfect portrait of Gandalf. Throughout this piece, the themes heard can be strong and proud like a leader, or fast and free like a horseback ride on Shadowfax. Really brilliant. I wish it was longer than six and a half minutes. This track is really wonderful. The sounds of Lórien are well represented. Sometimes it’s light and carefree, sometimes strong and ancient like the trees. Frodo’s visions in the Mirror of Galadriel are even represented towards the end. His feelings and what he sees in the mirror are well represented. Also, this piece sounds nothing like the others on this album. It makes sense because Lórien is like no other place on Middle Earth and you don’t know quite what to expect when you enter into the Elvenwood. Sometimes it can be spooky because Galadriel is said to be and Elven Witch, or exotic because of all the different plants and animals that live there. The sounds are sly and sneaky and the other instruments used make this track perfect for Gollum. There are a couple small themes throughout that pass from instrument to instrument (mainly the woodwinds). They well represent Gollum’s ever changing personality. This track has a spooky, dark sound to it. The endless journey can be heard along with the battle with the orcs. Gandalf’s theme comes in with his fight with the Balrog, and then the sadness of the fellowship comes after his fall. This is my most favorite track. The Gandalf theme is present at times along with the main Hobbit one. The Hobbit theme doesn’t sound as cheery and carefree as you may think. This Hobbit theme sounds more proud, yet there’s an innocence to it. It reminds me more of Frodo’s bravery on his quest or the pride Hobbits show when they tell about their people and culture to others. Also well expressed is a Hobbit’s loyalty. You should recognize this from Disney’s “Fantasia”. Because of that, I think of Mickey Mouse, but this really is fitting for Tolkien’s world. Instead of Mickey Mouse, it’s a nice fit for Gandalf’s fantastic fireworks. If you don’t have this album, you must get it! It is just so wonderful and I have listened to it over and over. Seriously! I think I may wear it out… I can’t help loving it! The sounds and themes are different from Howard Shore’s score, but this is just a different perspective. Howard Shore had to set his vision of what the music should be around dialogue and film, but Johan de Meij didn’t have any of that to worry about, so that’s another thing that’s different. The nice little booklet is purple! Other than that, it has nice little program notes for each track, a summary of the book, and notes on the composer and conductor. The CD comes in a nice little case with a very nice collectable wizard bookmark. 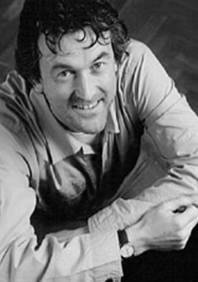 Johan de Meij was born on November 23, 1953 in Voorburg, Holland. He went to the Royal Conservatory at The Hague, where he studied band conducting and the trombone. Johan de Meij is an accomplished musician, performing on the trombone and euphonium in groups such as the Dutch Brass Sextet, the Amsterdam Trombone Quartet, and the Amsterdam Wind Orchestra. He has earned international fame as a composer and arranger, his catalogue consisting of original compositions, symphonic transcriptions and arrangements of film scores and musicals. The symphony was written in the period between March 1984 and December 1987, and had its première in Brussels on 15th March 1988. In 1989, his first composition for symphonic band, Symphony No. 1 “The Lord of the Rings”, was awarded the first prize at the Sudler International Wind Band Composition Competition 1989 in Chicago, and a year later, the symphony was awarded by the Dutch Composers Fund. The orchestral version was premiered by the Rotterdam Philharmonic Orchestra in 2001, and recorded by the London Symphony Orchestra. Johan De Meij does not attempt to re-tell J.R.R Tolkien’s epic tale, instead he picks out the well-remembered scenes and characters, gives them a musical voice of their own, and bring them together to form one breath-taking symphony. The symphony consists of five separate movements, each illustrating a key character or an important event from the book. 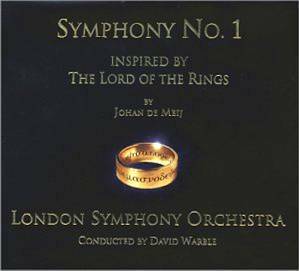 Many of us Tolkien fans have heard the amazing soundtracks of the LOTR trilogy, but before the movies were even in the first stages of its planning, many excellent Lord of the Rings inspired music were around for eager musicians and Tolkien fans alike, one of these being Symphony No.1. The two of us are in the same Concert Band, and have been lucky enough to have heard the original brass version of Symphony No.1, live at a concert, and after that hear a recording of the orchestral version. The Symphony starts off with a musical portrait of the much-beloved Gandalf, along with his magnificent horse Shadowfax. “Gandalf” begins with a grand, brassy sound, then slowly calms down to make way for the beautiful, mellow string sounds of the cellos, then bursts into the joyful violins and brass again, expressing the unpredictability of the mercurial Wizard. The stately theme representing Gandalf is woven in different versions into movements IV and V.
The second movement, Lothlórien, depicts the ethereal, magical Elvenwood of the Lady Galadriel. The saxophone solo in the beginning is haunting and lovely, and as the solo ends, the strings take over and then the woodwind solos enter, painting a lush, fairy-like world. It is grand yet an air of unease is detected in some parts. Frodo’s meeting with the powerful Elven Queen Galadriel is a joyful Allegretto, till Frodo takes a look in the Mirror of Galadriel. This movement ends with Frodo seeing the eye of Sauron, a frightening, foreboding omen. Gollum, or Sméagol as he was originally known, is a slimy, pitiful creature under the mercy of the One Ring, his ‘precious’. The Soprano Saxophone brings life to the cunning Gollum, whining and hissing to itself, with a pleading yet malicious tune. The colour of the saxophone tone alternates, expressing the two sides of the creature, wicked yet pitiful. The Saxophone solo, combined with the interesting percussion effects and woodwind solos, create an altogether charming depiction of Gollum. The second part of the fourth movement, The Bridge of Khazad-dûm, brings us into a wild pursuit, and the climax is when Gandalf is thrown into the abyss. We are revisited by Gandalf’s theme, now a strong, powerful melody as he battles the Balrog. The tone is melancholy and sad as the Fellowship find the East Gate of Moria and make their way South. Hobbits are by nature carefree and innocent, and this movement is cheerful, with a pretty, rustic tune. The peace, beauty and wholesome atmosphere of the Shire are shown her perfectly. While a lesser composer might have succumbed to ending off grandly with intense chords, this movement ends in a peaceful, bittersweet tone, signifying Gandalf and Frodo’s departure from the Grey Havens. We are reminded that Galadriel and the Lórien elves are also sailing away, as the familiar tunes from the second movement are played here. If you don’t have a copy of this CD, we recommend that you get one! It’s brilliant to listen to, over, and over again. I’d like to comment on the music of the “Tolkien Ensemble”. Some of these beautiful tunes were very likely inspired by the early tunes of the “Tolkien Society”. In East Lansing, Michigan during the late 1960’s the Tolkien Society sang many songs, some were old tunes with the words of Tolkien’s poetry, some were just parodies of well known songs (“filk” ) and some were original tunes by the members of the society. The Tolkien Ensemble music for the “The Bath Song” sounds like an adaptation of the tune that my mother (then Diana Welser) composed. A number of their other songs are very like the songs I grew up singing. I have not been able to find any connection between the composers, Peter Hal and Caspar Reiff and the original Tolkien Society, but I have to assume that there must be.